Grace is costly. It may accrue to us freely, but it cost Jesus dearly. Love is costly, as is peace-making reconciliation. It’s not enough to understand these things as abstractions. We must grow in grace-ness (graciousness) toward others—even those with whom we may disagree or who may have hurt us. Jesus was wounded in the house of his friends and betrayed by one of his most intimate friends. The disciple is not above the Master. We have been given a ministry of reconciliation to, and for, the world. This is a tall order. Wouldn’t it make sense that we figure out reconciliation among those who call upon Jesus as Lord before we try to export our convictions to others? Virtually anyone can preach a good sermon about the values of love, peacemaking, inclusivity, reconciliation, etc. But when an emotional, financial, psychological, or relational price must be paid to realize these virtues, few people are willing to make those sacrifices. Loving the Lord, we understand a little. Loving our offending brother, less. Loving each other in a cruciform way (as Christ has loved us)—well, few people have a graduation certificate from that program. 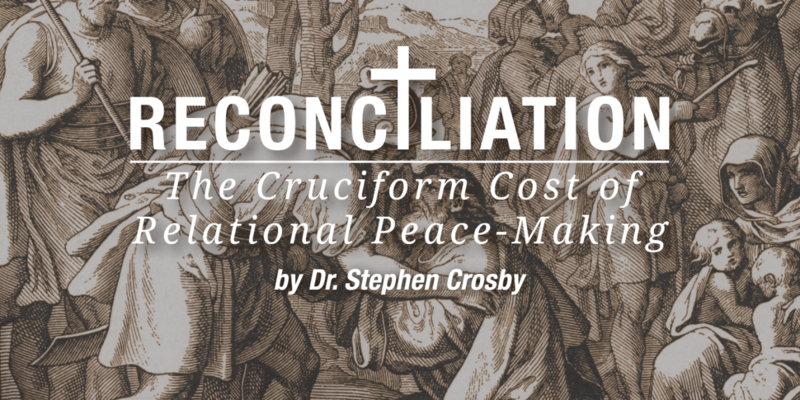 The familiar story of Jacob and Esau in Genesis 32-33 holds some lessons for us about the cruciform cost of being peacemaking ministers of reconciliation. Years of sin  passed and Jacob had a divine encounter with the messengers of God at the beginning of Chapter 32. If we had been Jacob, many of us would have written a book about our encounters with angels and chartered a bus to start our revival ministry tour. Note: In the very next verse, Jacob is reminded that he is not reconciled with his brother! The fruit of an encounter with God is an awareness of where reconciliation on planet earth is missing! Justifiably afraid that Esau might kill him,  Jacob gave his servants a specific message to convey. In this message, Jacob identified Esau as Lord and himself as Esau’s servant! A complete reversal of the “sure word” that he received from the Almighty through his patriarch father. In a sense, Jacob offered back to Esau what God had promised him, which rightfully belonged to Esau in the first place. Jacob did not demand Esau agree with him on the issue that brought the division. He yielded his right to be right, for the sake of winning back his brother. Restoring a broken relationship has to be more important to us than winning a doctrinal argument. It does not mean that our beliefs aren’t true or important. I don’t think that Jacob doubted the reality of what was his, even though he got it through deceit. But emotionally and interpersonally—he let it go—he let it go so completely that he was willing for a role reversal to take place just so he could be reconciled to his offended brother. The story unfolds as Jacob puts together a gift train for Esau. There are many cultural implications to this that I can’t go into here. The point is: the gifts cost Jacob something. They represented two things: the fruit of his life’s energy and work and the fruit of the genuineness of his repentance. God does not need us to “make good” to him in order for him to forgive us. However, other people may need us to do so. There is such a thing as manifesting (bringing forth) fruit of repentance. This makes hyper-Protestants nervous. It need not be so. We just need to remember: the fruit is directed human-ward, to restore and reconcile, not toward God. A good tree simply bears good fruit. Cheap repentance—“I said I’m sorry, so you have to forgive me”—is no repentance at all. The cycle of repentance (confession, repentance, and restoration) is not complete until, if within my power to do so,  I restore—make whole—those whom I have hurt. Their restoration has to be more important to me than my right to be right on a point. The story continues when Jacob has another divine encounter—wrestling with God at Peniel—where his name is changed. It’s no coincidence that the issue of reconciliation with an offended other was sandwiched between two divine encounters. This kind of reconciliation is humanly impossible. It’s also no small coincidence that Jacob’s name change came only after he had become aware of his relational alienation, given up his right to be right, and accepted the cost of reconciliation. The personal character transformation and sanctification that we may desire are inextricably linked to our relationships with others. Being a follower of Jesus is not about our personal piety. It’s thoroughly social and about having right relationships with God and humanity. As the gift caravan approached Esau, everyone bowed before Esau multiple times. Esau, in turn, greeted Jacob with a kiss. There is a cultural nugget we must see here. For Mid-Eastern people, a kiss was the way you greeted a social equal. Bowing, prostrating one’s self, was the way an inferior acknowledged a social superior. Jacob let Esau have the “upper hand.” He did not berate him with the “sure word” he received about himself being lord and his brothers serving him! Jacob let Esau have the honor that God had promised to himself. Jacob was okay with it. He didn’t react. Friends, we will never know the true depths of God’s love in relational reconciliation if we are unwilling to let go of who is the “rightest” about the Bible. Even the one who may indeed be right must be willing to forfeit the point. This is Calvary-style love on planet earth. Finally, and most profound to me, Jacob said to Esau: “When I saw you, it is as if I had seen the face of God.” He had just had two supernatural encounters! He had metaphorically “seen” or touched the essence of God. What is the fruit of the spiritual experiences? It is seeing, in the offended other, that God is present. When dealing with broken humanity, we are not dealing with ideals. Sometimes, when other parties are involved, reconciliation will not be possible. I get it. However, we can deal with our own hearts and come to grips with this Genesis version of Saul of Tarsus’ encounter on the road to Damascus in Acts 9. Jesus did not confront Saul about being “born again” to “go to heaven when he died.” Rather, Jesus confronted Saul with the reality that He was in complete association and identification with the “less than other”—the ones Saul considered (with proof text in hand) his enemies, worthy of death. Love your enemies. Pray for those who despitefully use you. This is basic, but costly discipleship, and it is the fuel in the engine of mission. The order of seating and the dipping/sharing of the sop in the upper room were all cultural signals of honor. Sin should be defined as relational alienation, not the common “miss the mark,” as in many concordances. The latter is not a Semitic understanding. The first recorded sin in scripture was relational alienation, not wrong behavior (Abel’s murder). Before the fall the woman was “bone of my bone, flesh of my flesh.” After the fall, it was—the woman you gave me—relational alienation. Justification is relational rectification/restoration. The last word we have from Esau was a death threat. Obviously, if I have murdered someone, I cannot undo that. But if I have deeply wounded someone, I can engage with God in the process of restoring the damage I have caused through reformed behavior, the fruit of my repentance. Copyright 2018, Dr. Stephen R. Crosby, www.stevecrosby.org. Republished with permission. Original Article.